Universal farm tank watering valves convert tanks or barrels into automatic stock waterers. Requires little attention and keeps open tanks filled with freshwater. 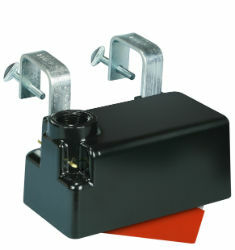 Adjustable to several heights and are easily installed by hanging plated brackets over edge of tank. Brackets for Poly tanks and installation instructions included. Designed to operate from gravity flow or pressure up to 70 PSI. Low priced, very efficient and reliable. Outer housing molded of high impact resin. Withstands weather and abuse. Durable molded float. Two sets of brackets - fits poly tanks and steel tanks. 300 GPH.